This year I've been accepted to Google Summer of Code :) Last year I worked on Banshee project , and this year I joined to GStreamer  team. 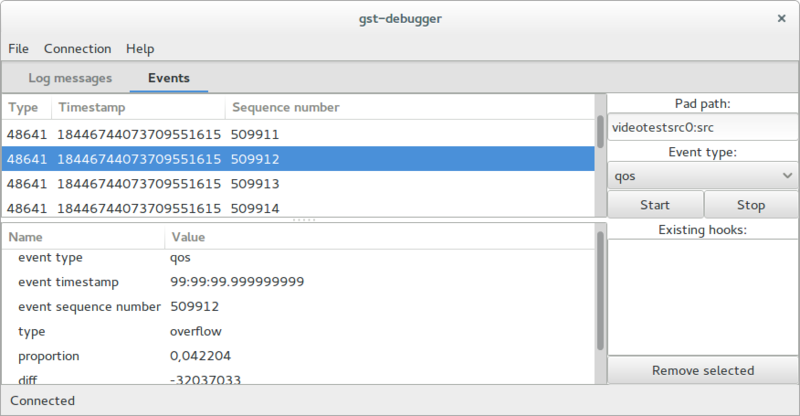 This summer I work on tool for GStreamer-based applications - GStreamer Debugger. At the end of this summer, I'm going to provide you an application, which allows you to connect to your remote pipeline (obviously, lo interface can be used as well :)), watch pipeline graph (and its changes), spy selected queries, events, log messages, messages from bus and log messages, and even buffers. Application won't allow user modify pipeline and pipeline's state, but who knows - if it is useful feature, I implement it in the future. GStreamer doesn't provide possibility to connect to pipeline, so I have to do it on my own. June is a month, when I've exams on my university (fortunately, I've already passed all of them! ), so I didn't spend as much time as I wanted on this project. Anyway, I accomplished a few milestones. 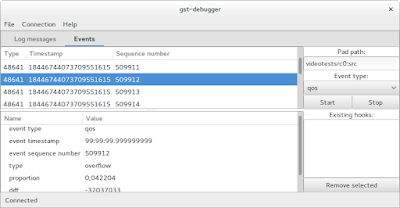 client application, which displays events and log messages (todo: display GstBuffers, GstQueries, GstMessages). I have a lot of ideas, how to improve client application, but I'm not sure whether I meet GSOC deadline, so I suppose, most of them will be implement after Google's program. protocol - I used Google Protobuf library . In general, I've defined most of protocol's structures, I just make minor improvements, when I need it. Below you can find a few screenshoots of client application. Full code can be found on my github account (, ).